In many ways the Donegal final was very similar to the Roscommon final from the previous weekend (review here). The losing team had a man sent off just after half time but the winning team was already imposing themselves (Clann na nGael were ahead through the main metrics if not the scoreboard). In both games the losing team had excellent shooting metrics up until the red card but then things fell apart thereafter (whether that’s due to the red card or scoreboard pressure is a moot point). One other point that struck me when doing this game was the pace of it. There were a total of just 69 possessions throughout the game. The Roscommon final had 75. The average for Championship intercounty games over the last four years is 96. Now we need to be cognoscente of the fact that the intercounty game is 10 minutes longer and that our club sample is a grand total of two! But it is interesting nonetheless. Generally when Gaoth Dobhair moved the ball they did so efficiently with a 78% Attack Rate and an 82% Shot Rate. (Comparing like with like Clann na nGael manufactured remarkably similar returns; a 79% Attack Rate and 82% Shot Rate). What really stood to them however was their shooting. They produced a 74% Conversion Rate to return 0.47 points per possession. They are both very good numbers. How this was produced is interesting. They didn’t manufacture a shot at goal and were reliant on deadballs to a large degree with 43% (10 of 23) of their shots coming from here. They converted 80% (0 – 08 from the 10) of these but that was more or less bang on average (Expt pts of -0.05) for where the frees were taken from. I say “reliant” but that is over egging it a bit as their point taking was very good. They were 69% on 13 attempts scoring ~2.5pts more than expected (yes yes I know you can’t score half a point ….). As can be seen from the below chart their shot selection was very good – or conservative depending on your point of view – with everything being within ~30metres and nothing wild from the wings. Also noteworthy that all 13 shots came from just five players with no defensive player (or at least those with a defensive number on their back!) taking a shot. Though only two points behind at the break Naomh Conaill were only chugging along in the first half. They managed to stay in the game through frees (0 – 04 from 4; Expt Pts +1.07) with their half being bookended by two points in the 1st and 32nd minute. That left 30 minutes in between where they recorded just the two attempts from play and didn’t score off either. Gaoth Dobhair’s defence tightened up in the second half giving up just the one shot from a free meaning that, with 14 men, Naomh Conaill had to produce from play. And unfortunately they were unable to do so scoring 1 – 01 from 9 attempts with an Expt Pts of -2.47. Part of that negative Expt Pts was the two missed goal attempts from E O’Donnell and J O’Malley however they were also 0 – 01 from 6 on point attempts. By the numbers the kickout battle was relatively even with Gaoth Dobhair coming out 19 – 17 on top. However Naomh Conaill were only able to keep on Gaoth Dobhair’s coat tails through their short ones. When the ball went past the 45 Gaoth Dobhair came out 17 – 11 on top and manufactured four more shots from those kickouts won (10 shots scoring 0 – 06 as against six shots scoring 0 – 01). Mannion’s late late goal would appear to give the Dublin shooting a boost that their shooting performance until that point did not warrant (they were running at an Expt Pts of -2.35 until the goal). In truth their shooting was average throughout with the two early missed Connolly goal chances putting them in a hole that only that late goal really bridged. Rock was excellent on deadballs hitting five from five though his Expt Pts return for that is relatively low at +0.93. This is due, as can be seen from the shot chart below, to the fact that three of his frees were from the 14m line in front of goal. These are converted ~98% of the time. From play their point taking was just below average with an Expt Pts of -0.56. Their conversion rate at 50% (0-10 from 20 shots) would not normally produce a negative Expt Pts however it occurs here due to the shot mix. Dublin were 71% (5 from 7; Expt Pts of +0.56) from central areas and 42% (5 from 12; Expt Pts -1.12) from wider out. Essentially they were very good on the easier ones, bolstering the Conversion Rate, and poor on the harder ones. This poorer return from the more difficult shots was not due to any particularly pressurised Donegal defending. Four of the seven misses did not occur under any pressure. This doesn’t appear to be something to get too worried about from a Dublin perspective however. In their two games covered to date (against Laois & Meath – the Westmeath game is on the “to do” list) they had a combined Conversion Rate of 53% (19 from 36) with an Expt Pts of +3.18 from these wider areas. The only caveat to those numbers is that Laois & Meath only pressurised ~31% of those kicks whilst Donegal got pressure on 50%. Donegal were very good on deadballs converting 89% with the only miss being Murphy’s long range effort from beyond the 45 in the 3rd minute. Their Expt Pts for these nine shots comes in at +2.41 but this is somewhat bolstered by the last free. Usually a free is tapped over from that distance and a point gains you a miserly +0.02 on Expt Pts (see Rock’s Conversion Rate to Expt Pts return). Here Murphy got the point but went for goal. We have only 10 instances of a player going for goal from this distance and the majority get blocked. The fact that Murphy was going for goal means that the Expt Pts for that shot was a low +0.33. 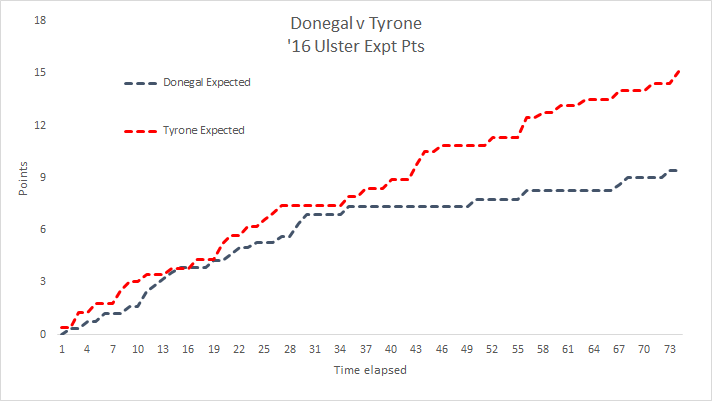 When the ball ricocheted over the crossbar he, and Donegal, gets a somewhat fortuitous +0.67 bump on Expt Pts. Donegal scored 1-00 from their two goal chances returning +1.28. So from deadballs and goal attempts Donegal were running at +3.69 which is in the 2014 “creating a shock” range. But then there is their shooting from play which in truth was both poor and meagre. Donegal returned 0 – 02 from 13 shots (Conversion Rate of 15% & an Expt Pts of -2.68). A lower expectancy is already built in to take account of the fact that Donegal were facing the best team in Ireland so the poor returns cannot be blamed on coming up against a good defence alone. Donegal had six shots centrally from outside the 20m line and only returned 0 – 01. Dublin managed to pressure just one of those six so four of the remaining five were misses from the central region with no pressure. You just cannot do that – with a lower shot count – against a team like Dublin. It is interesting to note that McBrearty didn’t get any shots from this central zone. After his heroics the last day he was restricted to four shots with all four coming from out wider. Against Meath and Laois they scored a combined 1- 15 from 38 possession on their own kickouts. This equates to 0.47 points per kickout won and 38% of their total score in those games. Here those figures were 0.82 points per possession and 78% of the total score. This game’s lop-sidedness does look like an outlier but that doesn’t make it any less impressive. Dublin gained possession on 17 of their 21 kickouts (81%) with 13 of those possessions ending in a shot. That means in scoring 1 – 11 the conversion rate for shots emanating from their own kickouts was 92% (!!) with the conversion rate for all other shots being 29% (4 from 14). Of those 13 shots the range of individual player possessions was 1 to 12 with the average being 6.1. So in essence from their own kickouts 6 players touched the ball (including the shooter) before they pulled the trigger. For the other 14 shots the average was 9.1. So Dublin held on to the ball a lot less from their own kickouts and were devastatingly incisive once inside the 45 on these possessions. On turnovers, or the opposition’s kickout, where they got ball much higher up the pitch they were more controlled, more methodical. And much less accurate. Styles make fights. If that is the case then, for 65 minutes, these were two counter punchers who warily circled each other with Donegal winning the first five rounds and Tyrone the next five. And then for some unknown reason they stood in the middle of the ring and threw the most spectacular haymakers at each other. But that probably doesn’t do the flow of the game justice. 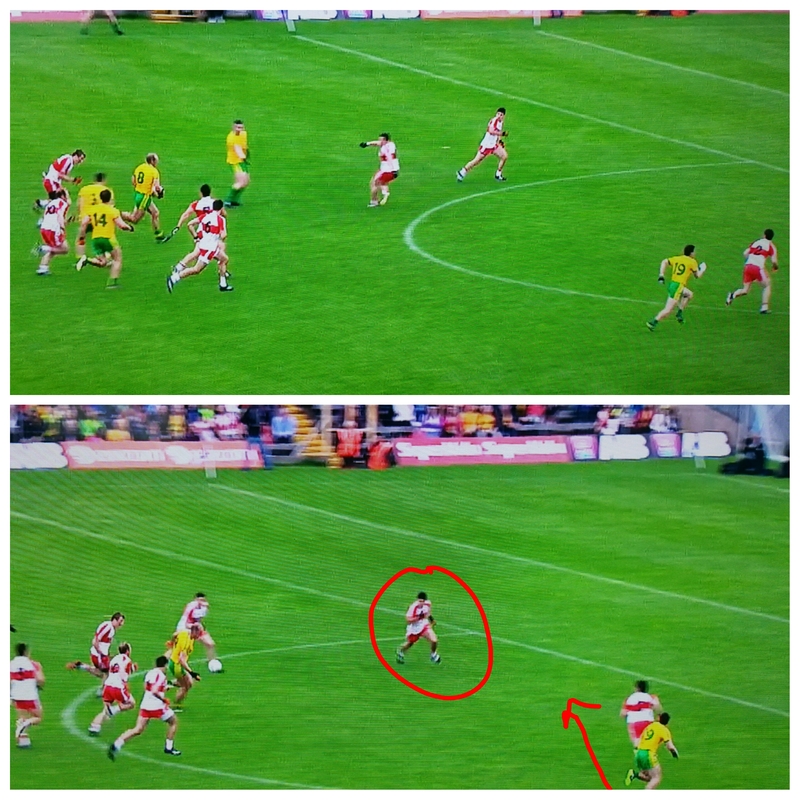 Whilst Donegal were three points ahead at half time this was due, in the main, to Tyrone’s abysmal shooting. 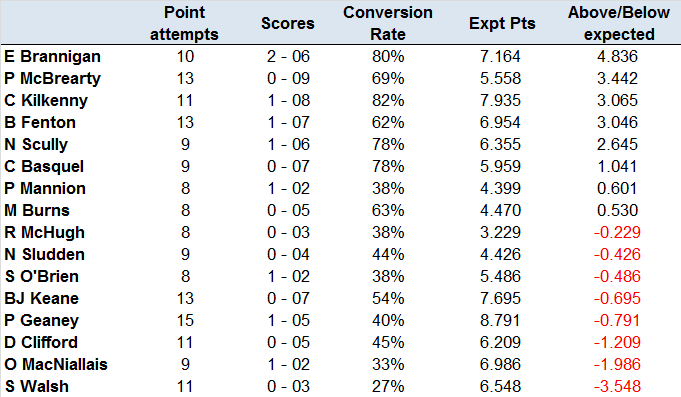 Donegal produced a below average Conversion Rate of 44% but were +0.11 ahead on Expt Pts. This was achieved by attempting difficult shots – two sideline balls from inside the 20m line anyone? – but converting enough to keep the scoreboard ticking over. MacNiallais nailed one from outside the 45 to add to Ryan McHugh’s three lovely righted footed efforts from out on the left. Indeed the best illustration of the difficulty of their shots can be seen in their shot chart (below) where they did not have a shot from play inside the 20m line. Tyrone on the other hand were atrocious. It is not a word I would normally use but 0 – 04 from 17 attempts for a 24% Conversion Rate and an Expt Pt total of -3.91 is just that. longer attempts but all inside the 45) but they had some very bad options in there; McNabb tight in the 1st minute, McShane basically a metre or two in from both the 45 and the sideline being prime examples. There was also some really poor execution; Mattie Donnelly’s pulled effort in the 23rd minute and Sludden’s central effort when under no pressure stand out in this regard. We can’t even attribute such poor returns to tenacious Donegal defending. From Tyrone’s 15 first half shots from play eight were charted as having no pressure applied to the shot. It was just a complete systems malfunction epitomised by the fact that neither Harte nor Séan Cavanagh had a shot in the half. The complete systems malfunction transferred itself to Donegal. They only managed six shots in the entire half and went a full 30 minutes with just two shots attempted. Their paucity of shooting is best illustrated by the Expt Pts graph below. Just look at how flat their second half line is. As in the first half Donegal struggled to shoot from in close but this time there was no long range shooting to augment their poor returns. MacNiallais got another bomb from the 45 but that was it – the only other shots from more than 30metres were the two late Murphy frees and Eoin McHugh’s effort in the 50th minute. So what happened? Tyrone engaged Donegal closer to the 45 – epitomised by McMahon hounding McGrath back 20metres and then just turning around and running straight back into the goal – but Donegal also appeared to run out of ideas. Or employ a very, very risk averse shooting policy. We will all be left with the memory of Tyrone’s final few shots but up until the 67th minute their shooting, whilst nowhere near as bad as the first half, was still below average. In that ~30 minute period they had a Conversion Rate of 45% (5 from 11) and an Expt Pts total of -0.59. And then they went, relatively speaking, berserk, scoring four from four. Harte & Cavanagh’s efforts were other worldly – as was Cavanagh’s earlier score from just outside the 20m line on the right touchline – but we must also remember that McCurry & McGeary were no more than five minutes on the pitch when they took their efforts. At a macro level the returns for both teams are very similar with just three possessions, 2 attacks & 1 shot separating them. Nothing untoward or unexpected given the recent history of these two teams. What did differ however was just how bad Donegal’s shooting was. It was much more erratic than Monaghan’s evidenced by the low conversion rate of 44% and leaving >2.5 points behind them. Donegal managed to create three good goal opportunities through Gillespie, McBrearty and MacNiallais. Those goal attempts returned an Expt Pts tally of +0.43. Given this was a positive, and the overall return was a negative then Donegal’s point taking is shown up as poor, bordering on feeble. Donegal scored 0-10 from 24 point attempts (42% conversion rate) with a combined Expt Pts of -3.29. Their shooting from play was below average (38% with an Expt Pts of -0.62) but not terrible – it was their free taking that really let them down. Before we turn to Donegal’s deadballs we need to touch on Monaghan. They will be very concerned with their last quarter as, after the red card in the ~55th minute, they only managed to create two shots more than Donegal and more worryingly they only created the one shot from play in those final 20 minutes. McManus was outstanding from frees converting 78% (7 from 9) with an Expt Pts tally of +0.93. The raw numbers do not do justice to his performance however as his 6th and 7th points were both converted from outside the 45, in injury time, whilst one of the misses was basically on the 20m flag from the right with the right foot. Possibly of more importance for Monaghan, looking towards the replay, was the 33% conversion rate of the supporting cast. Monaghan rely on deadballs more than any team so to see K Hughes & R Beggan miss their only free – both from the right as was one of McManus’s misses – will be of slight concern to Malachy O’Rourke and his management team. Whatever concerns Monaghan may have in this area will pale into insignificance compared with those of Donegal. 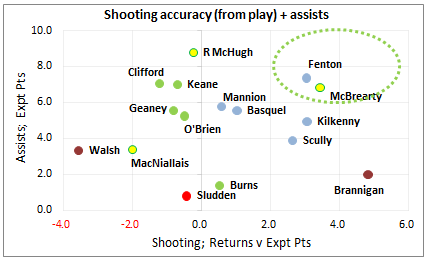 McBrearty & Murphy were 45% from 11 attempts and had a combined Expt Pts of –2.53. In such a tight encounter you cannot leave that many points behind you. On raw returns McBrearty would escape much of the blame scoring 0-03 from his four attempts however the one he missed was on the top of the D and should be converted 70-80% of the time. Murphy was very poor scoring 0-02 from 7 attempts. There are mitigating circumstances in that two of his misses were outside the 45m line whilst a third was just inside the 45 from wide on the left. Even if you were to be generous, and exclude these three attempts, his returns were 0-02 from four with an Expt Pts tally of -0.67. Include them and the Expt Pts tally rises to -2.12. We know Murphy is better than that. History has shown us that he is an above average deadball striker. Donegal will need him to (re)find his accuracy in the replay. Much was made of the kickouts – especially Donegal’s – at half time in the Sky coverage. The gist being that the fact they had lost 4 of their 12 first half kickouts (whereas Monaghan lost just one of their nine) showed a poor kickout strategy. At the time I was a bit dismissive of this as Donegal had netted 0 – 03 (Donegal scored 0-04 from the 8 they won whilst Monaghan scored 0-01 from the 4 they won) from their own kickouts whilst Monaghan had scored 0-01. However when we look at shots created from kickout possessions it was level at 5 apiece at half time. Extend that out to the 70mins and Monaghan created 10 shots from the kickouts they won to Donegal’s 7. The loss of Durcan does appear to have robbed Donegal of some of their subtlety on kickouts and what is easily decipherable can also be easily targeted. Finally a quick note on the goal. Donegal had just gone down to 14 men and this was the first Donegal possession after this. Timely indeed but given the game situation it was surprising to see MacNiallais in acres of space in front of goal. As can be seen above MacNiallais got a helping hand to create this space. Fintan Kelly (18) was marking MacNiallais (9) whilst Gillespie was also being man marked. MacNiallais got free however as Gillespie managed to step across Kelly and “help” him to the ground thus freeing MacNiallais up and giving himself a yard on his marker to receive the ball. There is no point pretending that this game was anything other than a run out. As Chris McNulty commented on Twitter (@chrismcnulty86 – a good follow on all things Donegal) Donegal took the game so seriously that they didn’t train all week. I have completely forgotten who, so apologies for not crediting, but some other wag commented that it was like an exhibition match at the opening of a new ground (see note1). It just had that feel to it. Still. The two teams may not have engaged as if it were the height of Summer but we we’ll fire up the numbers and see what it throws up. In the opening league game between these two Dublin were restricted to a 76% attack rate and 21 shots. Here it was an 88% attack rate and 30 shots. Again in that opening game Dublin managed (or maybe more accurately the Donegal defense allowed) 0.29 points per possession. Here it was 0.44. There was just no bite to Donegal. It was not like there was a huge difference in opportunities between the halves either. The goal at the start of the second half did not see Donegal switch off. Both, by some statistical quirk, had stat lines of 26 possessions with 23 attacks and 15 shots. Dublin were slightly more accurate in the first half with a conversion rate of 73% (0-11 from the 15 shots) though the second half conversion rate of 67% (1 – 09 from 15) was also very efficient. Although they may not take much from the game one positive aspect, from a Dublin perspective, is that their early accuracy came despite the fact that two of their main strife force, Brogan & Mannion, combined for a mere two shots in the first half. What of Donegal? It may come as some surprise to note that – in pure shooting terms – they were not all that far behind Dublin. The above graph shows the team’s respective shooting broken down into actual score vs Expected score (see note2). 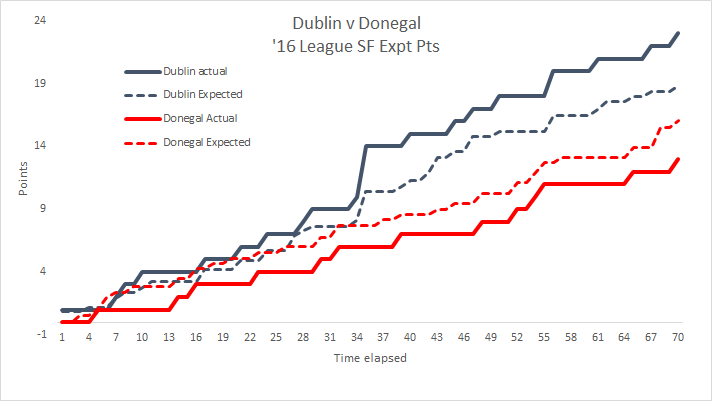 Donegal, despite what was noted above re application, were on track with Dublin up until the ~33rd minute. Dublin tagged on 0 – 03 at the end of the first half and kicked off with a goal at the start of the 2nd but up until then Donegal were right with them. The “but” quite obviously comes with caveats. The first being that whilst teams with average returns from the shots attempted would have been level around the 33rd minute Dublin are not average. Nor in their own ways are Mayo or Kerry. Dublin outperformed their Expt Pts from the get go (as an aside Kerry did something vaguely similar against Cork. That day they score 0 – 10 from their first 12 shots inside 20 minutes and were up and gone. It will be interesting to see the starts both teams make, or are allowed make, in the final. But I digress). On top of this Donegal lagged behind what was expected. One of the hallmarks of the 2012 & 2014 teams was their remarkable accuracy in games where the shot counts were very low. They will need to regain this accuracy. A second point on the Donegal shooting was just how reliant they were on Murphy & McBrearty. Here they accounted for 70% of Donegal’s shots (Dublin’s top 3 marksmen in terms of Volume – Rock, Brogan & Kilkenny accounted for 52% combined). In the opening league game this duo accounted for a more realistic 45% of shots. 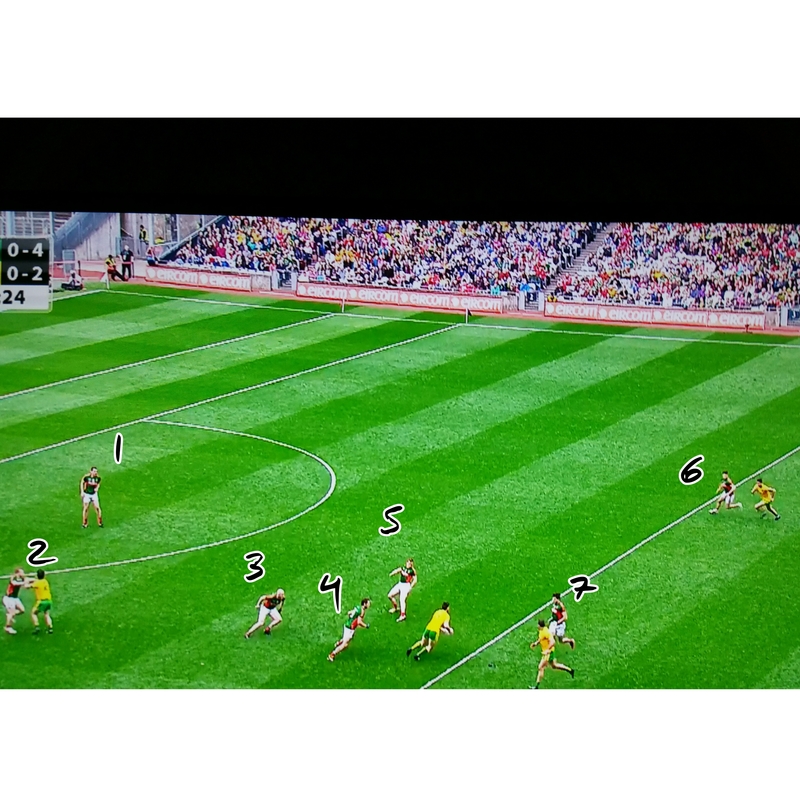 Part of this over reliance on Murphy & McBrearty was Donegal’s volume of shots from frees. In total they had 11 shots on goal from free kicks. Dublin had a mere four (plus one 45). Relying on frees as a way to keep the scoreboard ticking over is a tried and trusted manner but in many ways it is dicey proposition as gaining a free is not always within your control. You are reliant on the defender’s, and perhaps more importantly the referee’s, complicity. Finally Dublin’s Expt Pts was boosted by creating goal chances. They had four shots at goal in total scoring 1 – 01 (about what is expected). Donegal only manufactured the one shot at goal and that a weak, in terms of where the shot was taken from, one from Murphy in the dying embers of the game that went straight at Cluxton. In fairness in the three other Donegal league games that I charted (Roscommon, Kerry & Dublin) they came out even in goal shots in all three so this game may not be emblematic. So is there hope for Donegal? Absolutely. Over the two games they created as many shots as Dublin. In the first game, when they were not at full tilt but were at least more inclined to try than here, they were able to restrict Dublin’s shooting. But there are also some obvious dangers. They must ensure the shooting volumes are not as concentrated as in this game and also improve their accuracy from play (1-06 from 27 shots over the two Dublin games for a success rate of 26%). The control – in terms of game tempo and shot selection – needs to re-emerge. Goals need to be kept to a minimum. The restrictive game plan does not lend itself to chasing games. Note1; if you have a twitter account it’s probably better to follow me there (@dontfoul). I tend to have game “scorecards”, like the below, up a lot quicker than the blog posts. Plus by having the game capsule up there I don’t feel the need to get every stat up here! Note2; I have a piece half written on Expected Points which I will publish prior to the Championship. In essence it is the same measurement as the weighting that has been used heretofore but (hopefully) is a lot more readily understood. Both teams had a similar number of possessions and when they took a shot they produced very similar returns in terms of accuracy & weighting. There the similarity ends however. There is then of course the goals. Goals win games. Mayo had three attempts and scored 2 – 00; Donegal had two and managed 0 – 01. Some very neat shooting games (see the player table at the end) but the majority were from Mayo men. Murphy aside no one from Donegal stood up. 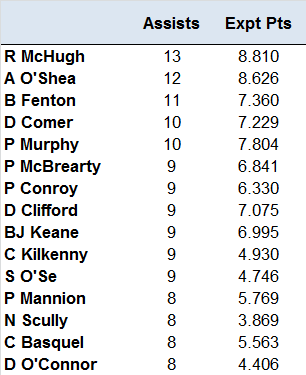 McBrearty & C McFadden were marked absent with neither producing a score from four attempts whilst McGlynn was the only other player to attempt more than the one shot. There were indications that the system was failing however; in the first half, whilst the game was in the melting pot at 0–03 to 0–02, Jason Doherty found himself in acres of space on Donegal’s right. For whatever reason Hugh McFadden (21 below) and Neil Gallagher (9) completely got their signals wrong which meant that Lacey (6) wasn’t in a position to cover. Gallagher had Doherty put passed him on to McFadden – McFadden missed the cue and pushed up on his man allowing Doherty acres of space in behind. Mayo on the other hand were getting it spot on. 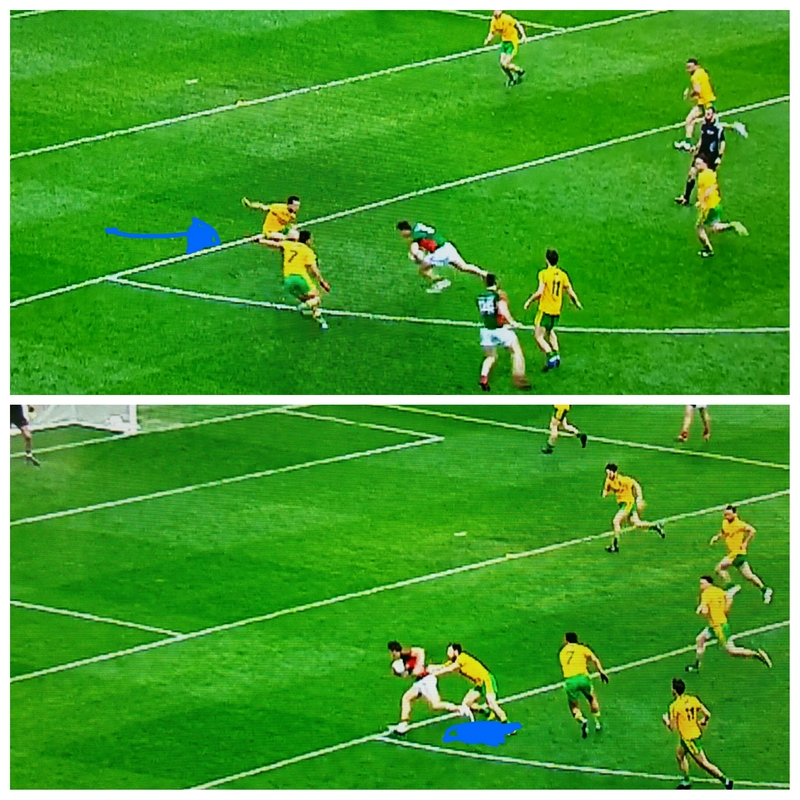 The first picture below shows an intercepted hand pass that takes three Mayo men out of the play – perfect Donegal counter attacking ball. Donegal attack hard up the middle however Mayo, unlike Dublin last year, have a man to stop the initial run whilst the cavalry work hard to get back and block the easy running hand passes. 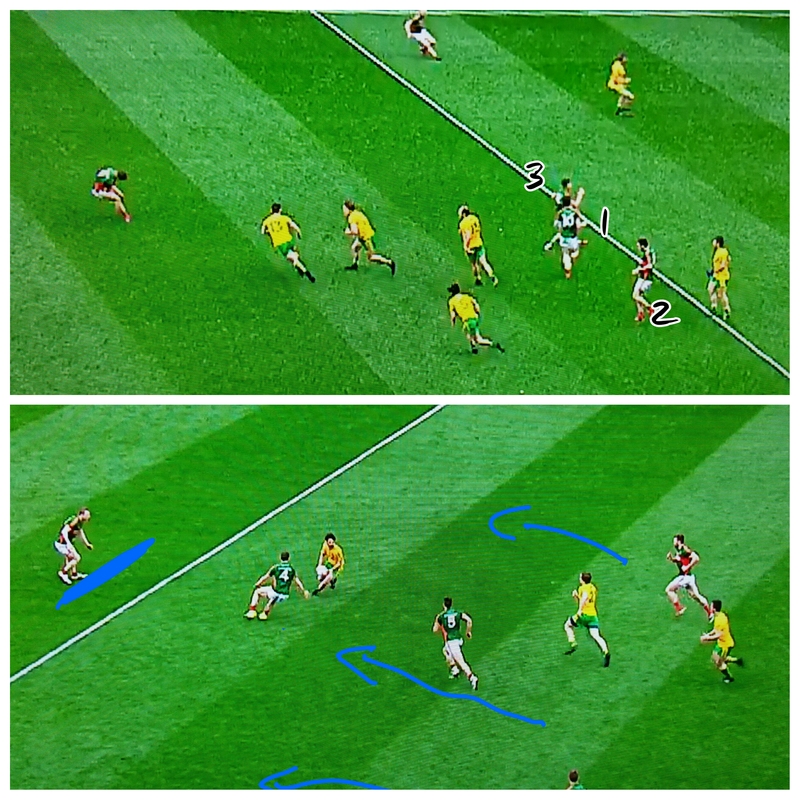 Similarly in the next instance – again an intercepted hand pass on Donegal’s 45 – we can see that Mayo are set up perfectly with Donegal runners tightly marked and spare men back to choke the space in the middle. What appears like a particularly poor day for O’Connor does in fact highlight one of the weaknesses in Mayo’s game. O’Connor is probably the most accurate deadball striker over the past few years however he does have a specific range. The three he missed here were outside that – two from the right and one long (a 45). My guess is that he took on these attempts not because he thought he would get them but because there is no one else stepping up. Murphy missed both his attempts from outside the 45 and whilst he converted a 45 the remainder of his attempts were deemed on the easier side (3 of the other 4 that were converted were inside the 20m line) so his returns come out as “average”. 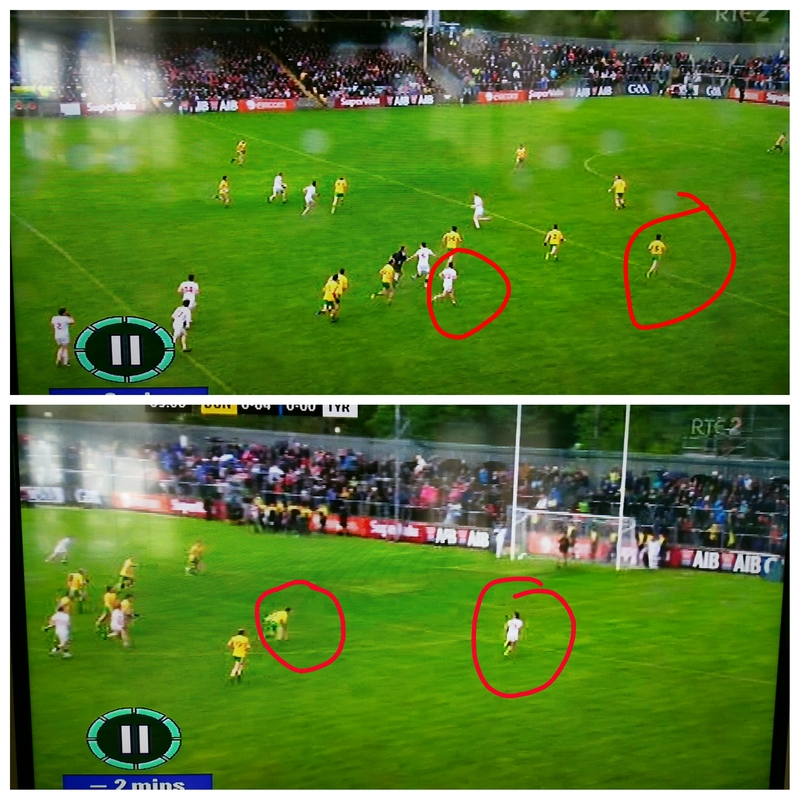 The TV cameras missed where three of Mayo’s kickouts landed but none of the three went past the 65. Assuming this Mayo only kicked two of their kickouts long. In total Donegal scored 0 – 01 from the 4 Mayo kickouts they won but Mayo scored 1-04 directly from their own kickouts. Not pushing up on the Mayo kickouts ultimately did not work. Donegal basically had two kickout ploys – long or short. None of their kickouts, that the TV cameras picked up, landed between the 45 & 65m lines. Of the 13 that went long Donegal won the possession battle 7 – 6 however they were unable to use this possession scoring just the one point. Mayo returned 1–02 from the 6 that they won. Of the remaining 8 that went short Donegal scored 0–02 but they did lose one of their short kickouts which resulted in a point for Mayo. 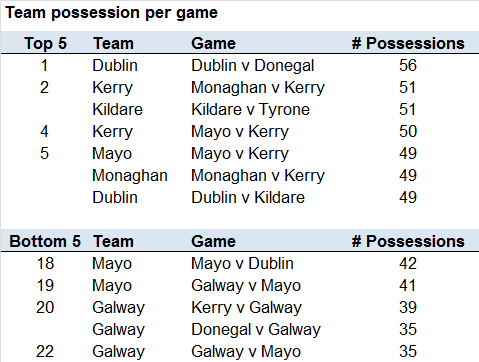 If we consider turnover from shots to be of a different nature than the rest (which I do) then Mayo were very careful with the ball only coughing it up 18 times – and only five of those were through the tackle against a historically very strong defence. Of course they won’t want to turn the ball over on so many shots the next time but nothing we have seen – either from Mayo or from the numbers in general – leads us to believe that this is a predictable trait from one game to the next. Pretty poor returns all round. Under McGuinness Donegal were capable of these *stinkers* (Armagh QF in ’14 to name one) so in many ways I’m sure Donegal will take the win and move on. Still there will be areas that will be of concern. The first picture is taken 5 minutes in – Lynn has acres of space in the D. The defensive system completely disintegrated very early on. Below is with five minutes to go. Donegal fell asleep as Lynch stood over a free with the game in the melting pot. They switched off expecting him to take the shot at goal but he astutely shipped it across and Derry had free men over. Derry? In many ways they shouldn’t have been in the game as normally – given Donegal’s accuracy – if you have 8 possessions less than Donegal you’re toast. However the fact that they were in the game with ten to go will make the ending galling. Niall Holly took a shot at 65:32 that dropped short. Derry didn’t touch the ball again until 69:44 after two reckless frees allowed Donegal to chew up the clock. The clock is your enemy two points down with five to go – don’t aid the opposition in its winding down! Poor shooting from both teams. Donegal seemed to take poor options early on with three shots being blocked (McElhinney, Macniallais & McFadden) and it never picked up thereafter. In the first half when going for a point they scored 0 – 04 from 15 attempts (27% Success Rate) for a combined weighting of -2.497. Although the volume reduced the accuracy increased in the second half; 0 – 04 from 8 shots (50%) with a combined weighting of 0.695. Derry in many ways were the exact opposite. 0 – 03 from 7 attempts (43% Success Rate) at a point in the first half but only 0 – 04 from 12 (33%) in the second with a combined weighting of -1.471. What might have aided that negative weighting was who was shooting – the last 8 Derry shots from play came from Johnston, Heron, McKaigue, Bradley, McFaul, Holly, Johnston & MacAtamney. You give credit to players for stepping up but I’m sure Derry management would have liked to have seen Lynch, Lynn & O’Boyle chip in. One thing that did separate the two teams was the goal. Derry had two chances – one at either end of the game and got nothing from either. Donegal also had two chances but got the goal. That goal was a beautifully measured hand pass from Gallagher to O’Reilly, which meant that he didn’t have to check his stride, *but* he was only free due to a split second decision by Duffy. As you can see below Duffy has O’Reilly but as Gallagher breaks through the centre he moves across to cover the space. Derry had a man coming in to fill that gap; had Duffy held his run with O’Reilly it is likely that Gallagher would have checked the run or popped a point. As I say that is a split second decision that Donegal were good enough to exploit. There are hundreds of them in a game that all feed in to the result – it is just that those in the build up to a goal are magnified. I guess it is kind of surprising to only have nine shots at goal from deadballs in an Ulster game. In the Ulster Championship games covered so far this year there have been 19, 21 and 10. That number gets whittles down again when you consider that 2 of the attempts were from outside the 45, one was a 45 and one was stuck out on the sideline. Five shots from deadballs in scoreable positions is testament to the discipline of both defences. As to the quality of the strikes? Murphy’s weighting does not do justice to the difficulty of his strikes – having said that neither were struck with any quality. The same could be said of O’Boyle’s 45 whilst Bradley’s miss from the right was poor. Donegal absolutely lorded the kickouts – in many ways it was Derry’s good fortune that there weren’t more of them! In the first half Donegal won nine of the first ten kickouts with six of those wins coming off Derry kickouts. Derry kicked their first four long but lost three. This seemed to panic them and they lost the next two very poorly; one was short and the second was mid length straight to a Donegal man. Donegal really should have been further ahead given the volume of primary possession they had. In the second half Derry had nine kickouts. They won five but all those went short – of the four that went long Donegal won all four and scored 1 – 01. Donegal were relatively comfortable and in the main played it safe. 13 of their 21 kickouts landed short of the 65 with Donegal scooping up the ball on 12 occasions. When they went past the 65 they lost the possession battle 3 – 5. One of the problems with just reporting the turnovers is that there is no context for the negative returns (as all turnovers are viewed negatively!). 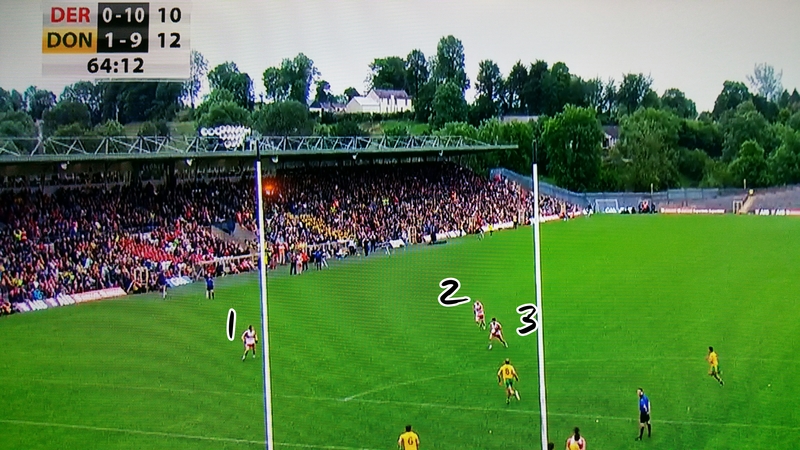 Donegal had 17 missed passes but five of these were boomers onto the square – how many of those stuck? Five turnovers from five attempts is obviously poor – but was it five from five? Or five from 10? Bearing the above point in mind Neil Gallagher was involved in seven of those passing turnovers – misplacing a kicked pass three times and losing a contested ball on four occasions. That is not to say he had a poor day but rather to highlight how central he was to what Donegal were doing. The eight turnovers from shots is poor – and probably not something that will be oft repeated. As commented upon above Donegal had a particularly poor shooting day and you would expect this to get better as the Summer progresses. Derry were neater though Eoin Bradley had a tough day. As well as the four shots that were missed he was involved in another four turnovers. Colm McFadden was given man of the match after converting two beauties however it seems to be forgotten that his four shots previous to that were poor with 1 being blocked, two landing in the goalkeeper’s hands and one going wide. Yes his two points were impressive but after 2014 I will need more than that to be convinced he is back. Tyrone had their chances. They had two more shots than Donegal, after engineering 12 more attacks, but ultimately it was Donegal’s superior shooting and efficiency that saw them through. Sound familiar? Below are the returns from the 2013 game. Eerily similar. The faces may change (Joe McMahon, Stephen O’Neill, Rory Kavanagh, Leo McLoone, Jim McGuinness) put the pattern remains. Both teams went about accumulating their shots in very different manners. 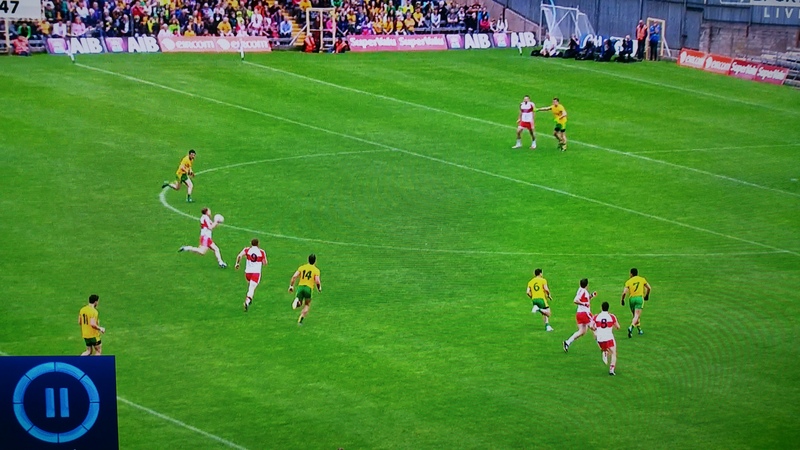 Donegal dropped back not engaging Tyrone until they crossed their 45. This enabled Tyrone to convert a very high proportion (90%) of their possessions to an attack. Tyrone on the other hand were more inclined to press thus stopping Donegal getting vast sways of their possession into an attacking position. As we have seen however, both in the corresponding 2013 fixture and throughout this team’s existence, Donegal are deadly efficient when they are at their best. One might think that a large part of Tyrone’s inefficiencies here came from their goal attempts. They did have six shots at goal with only McCurry’s attempt registering however when they went for points they were only average – a combined stat line of 7 from 15 (47%) with a weighting of -0.141. Looking at the shot charts below there weren’t too many outlandish speculative attempts – it was just average shooting from average positions. Donegal on the other hand were 59% (10 from 17) with a combined weighting of +1.535 when going for a point. One area Donegal will review is the Tyrone goal. McCurry found himself in acres of space after drifting in behind the defence following a quick free in the middle of the park. Excuse the poor drawing (!) 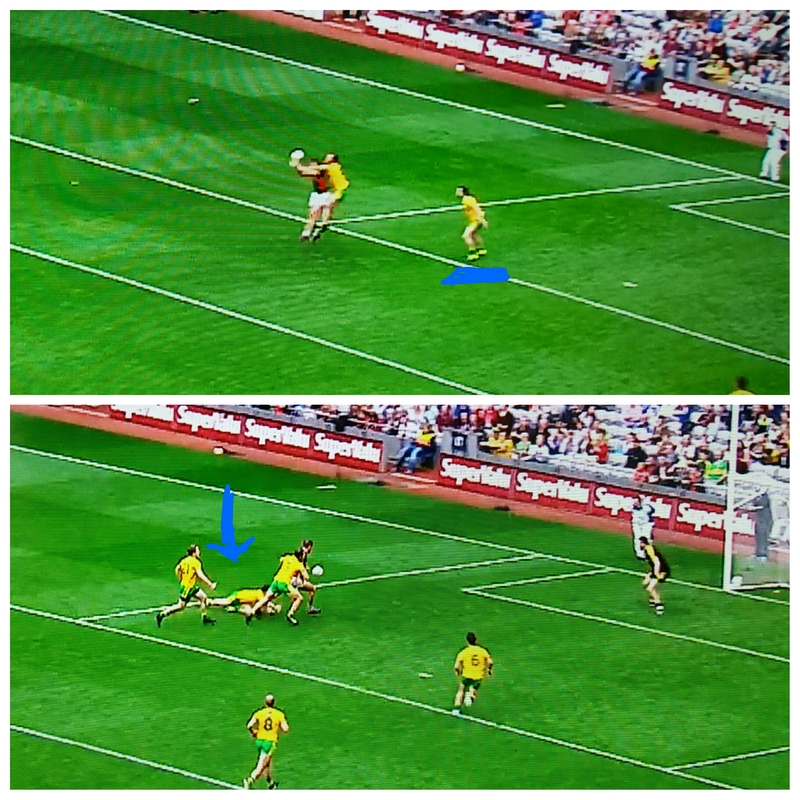 but you can see in the below snapshots that Donegal had plenty of men back but Ryan McHugh got sucked into the ball allowing the space to appear. All the regulation frees were converted. Séan Cavanagh’s placed ball day was good getting the two in front of goal you would expect any intercounty layer to convert whilst also swinging over the only difficult one he had from the left. In 2013 Niall Morgan had a poor day converting one from six however he was in the main attempting very difficult long range “boomers” that are missed more often than they are converted. Although McCurry only missed three frees, compared to Morgan’s five, his day was perhaps even worse given that two of his frees were relatively easy. Granted the one in the second half was against the wind but he missed on the *near* side. It was to Tyrone’s credit that Donegal’s first attempt at a score from a free was not until the 51st minute. Murphy missed that one but then took over converting two long range efforts including a 45 near to the right sideline – the *wrong* side for a right footer. One area that Donegal will no doubt review is their turnovers. Not necessarily the volume but where they gave them away. Of the 20 turnovers given up four were within their own 65. Tyrone only managed one point from this but in another tight outing – against Armagh or possibly Monaghan – that could yield precious scores. Perhaps even more surprising is that Karl Lacey gave up three of those four. I’m guessing he won’t like this week’s video review session! At a macro level Tyrone won the kickout battle. 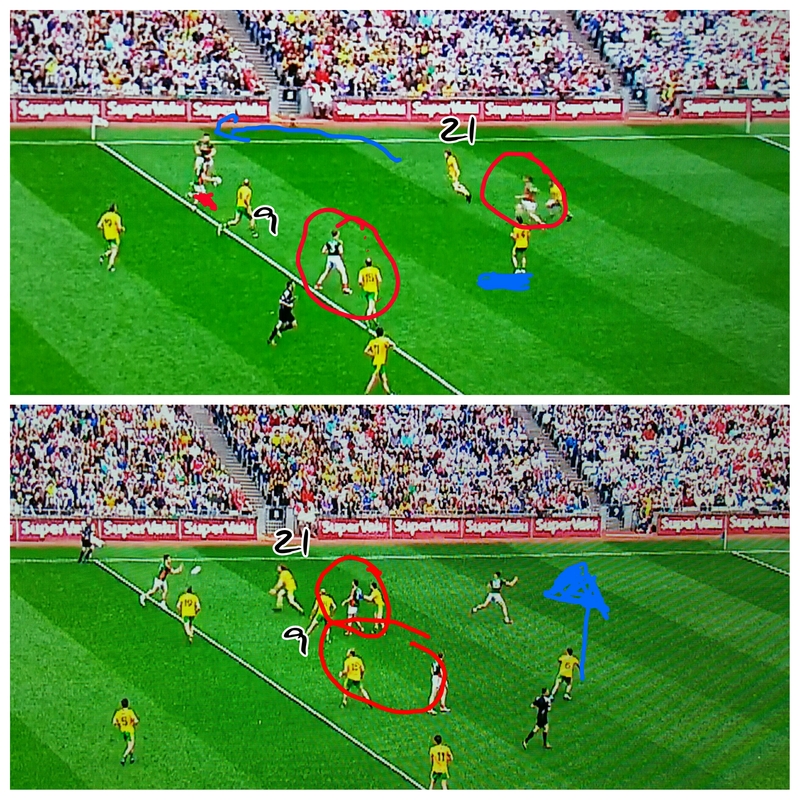 Donegal’s kickout, from a volume & shot perspective, was a washout whilst Tyrone kept the ball by going short on their own. Strike out the short kickouts – which are not really contestable – and Tyrone win the kickout battle 15 – 12. Not as comprehensive but still a position of strength. Donegal went short on four of their kickouts; of the 17 that crossed the 45 Tyrone got their hands on ten. Once they got ahead Donegal did not go short once. On the opposite end of the scale Tyrone went short with 50% (10 out of 20) of their kickouts. Of those that passed the 45 the teams were split 50:50 (5 apiece) in terms of who came up with the ball. Against the wind in the second half they went short with 78% (7 out of 9) of their kickouts – this was obviously aided by Donegal who were dropping back to protect the lead. Note; I’m not sure if it was an issue with my feed or RTE but there was a blue screen for one of McElhinney’s attempts at a point. We know it went wide but we do not know where it was taken from so it is not represented in the above chart. For weighting purposes it is assumed the shot was taken from Sector 4 as the camera panned to McElhinney trotting back to midfield from the right hand side post shot. Nothing earth shattering though it is noteworthy that McFadden got two of his three attempts. As noted (here) he had a very poor 2014. It was nice to see him back converting one lovely one with the outside of the left just before half time as well as jinking through for a shot at goal that was ultimately called back for a foul he incurred on his way through.